Carcar, formerly called Sialo or Siaro, was originally located at what is the present site of barrio Valladolid, where it was an easy prey of Pirate raids. Once relocated to its present site, they called it first Mowag or Kagbkab, the name of a tall fern tree abundant in the area; and later on the name was hispanized into Carcar. Vela calls it Kabkar. The present Carcar is located on elevated terrain by the coast not far from the sea, bounded by San Fernando and Sibonga, Barili and coast. On May 23, 1559 the council accepted the “convent of Our Lady of the Visitation of Siaro in the coast of Cebu as house of the Order,” and authorized the father provincial to appoint a religious to reside there. This suggests that Carcar was hen merely a visita of Santo Nino. On June 9, 1601 its acceptance was reconfirmed after have secured a consensus from the senior fathers, all of whom voted in favor. As in the previous meeting, no priest was assigned there. 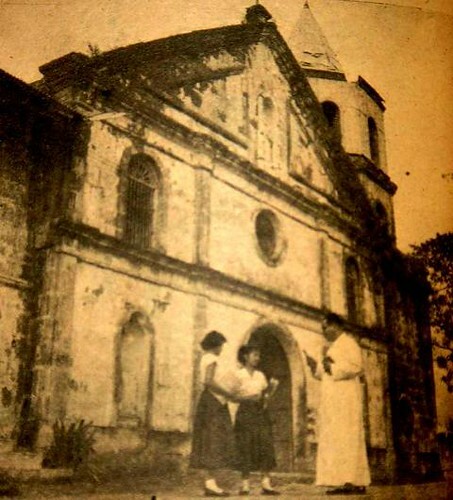 The acceptance was reaffirmed in 1607 but no action was taken on the assignment of priests; but the convent was made a priory, suggesting that Carcar continued as a visita of the Santo Nino until Fr. Juan de Ricobayo was named prior later on the same year. Soon after, it was made a vicariate, and the father provincial was authorized to appoint a minister as he wished. In 1610, the prior was given voting power in the provincial councils. In 1611, Carcar was placed under the administration of San Nicolasde los Naturales de Zebu. On April 29, 1617 it was segregated from it. The Libro de Gobiernostopped using the name Siaro from 1620, using instead, Cabcar and Carcar alternatively. The convent was asked in 1653 to pay an annual rent of 300 chickens to the Santo Nino. This was commuted to 100 baskets ofborona in 1659, and the arrangement was maintained until 1662. The prior lent 2,000 pesos to Fr. Manuel de la Cruz, representative to the court of Madrid. The loan, made in 1684, was to help Fr. De la Cruz defray the expenses for one of the missions to the Philippines. This could only have meant that the finances of the convent were in good shape. No wonder Fray San Agustin called it one of the biggest in the province of the Visayas. The district of Carcar was extremely large and had many tributos; as a result, the father provincial proposed to have it divided on October 31, 1690. Thus, the matrix of Santa Catherina (sic) of Carcar remained with the visitaof Simora, Sibonga, Argao, Dalaguete, Camayan, Mabuli, formerly as visitaof Carcar, became the matrix of the other vicariates that had Oslob and Tanong, as visitas. The two vicariates were independent of each other, and the prior of each was entitled to name one vicar. In 1732, Caarcar had 1,116 souls. In 1760, it had 2,690 souls. In 1898, it had 24,230. In 1990, the population reached 70,842. 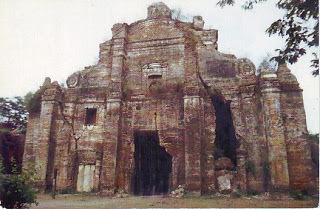 The first parochial buildings were burned by the Moro pirates. Historian Marin, however, does not specify the year of how many times the buildings were burned. Carcar, a flourishing matrix, must have had a good church and an equally good convent. One of the bells, inscribed with the year 1810, suggests that the church was finished in the early 19thcentury, if not earlier. The report of Redondo y Sendino, published in 1880, refers to the church as new. Fr. Antonio Manglano started building the present church in 1860. This must have been the second or third. Fr. Gabriel Gonzalez continued the construction in 1865. Fr. Manuel Fernandez Rubio finished it in 1875, including the painting of the interior which astounded even experts. Fr. Rubio was also responsible for the construction of the road leading to the beach. The church of masonry has one main nave and two aisles. It is 68 m. longs, 22 m. wide and 12 m. high. It belongs to the Graeco-Roman order. 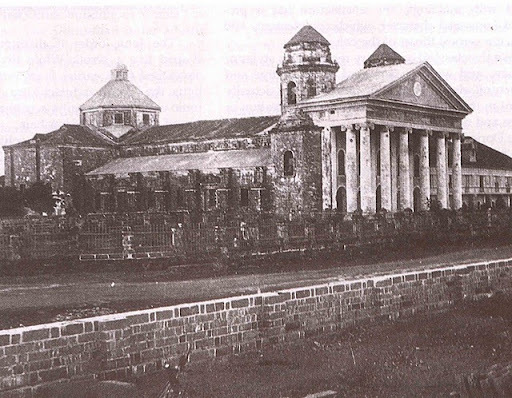 The roof of the church and convent sank during the typhoon of November 25, 1876. Fr. Rubio also constructed the masonry and wood convent. It measures 33 m. in front and 22 m. on side. Fr. Gonzalez was imprisoned together with some of his parishioners on April 5, 1898 in the prison of Nicolas. They were captured by the revolutionaries of Carcar. All of them were freed with the help of a parishioner, Simplicto Sacedon. The church is of Graeco-Roman style with strong Muslim influence. The many entrance has a double arched design inviting attention to the massive rectangular façade. The twin bell towers, solid geometric pylons, act as buttresses but are integrated as part of the façade. They end up at the third level in the minaret shape common to mosques. Planes, recessed arches and surfaces of the bell towers are the important factors here. The only embellishments that have been provided are the geometric flora on the spandrels, the blind rose window below the upper recessed arch and the carved Augustinian symbol above it. The simplicity of design of the façade is counter-foiled by the complex pattern of the upper story of the Muslim-like bell tower and the Baroque pediment. The statues of the 12 apostles, a recent addition to the church patio obstructing the view of the façade, are all carved in white except for one which is in black; the of Judas, the traitor, which the parishioners call the “penitent”. Angels and Stones by Rev. Fr. Pedro G. Galende, OSA, 337-338. A day before the feast of the Sto. Niño, a solemn foot procession is honoured in the name of the Holy Child. While the image is on procession, another image of Sto. Niño arrives at the Basilica that comes from San Nicholas Church (an Augustinian built church). He stays until the original image returns to his home church. Most devotees of the Sto. Niño do not know why another image of the Holy Child is to be placed at the Church. What do you think is the reason of this tradition? This tradition dates back to the time when the original image was awarded with a Spanish military rank of Excelentisimo Capitan de las Fuerzas Españolas en Filipinas. However, to better understand this tradition let us visit the book of Rev. Fr. Pedro G. Galende, OSA, who wrote a detailed research on the tradition. The following text below is an excerpt of his book Santo Niño de Cebu, 1565-2015, 450 years of History, Culture and Devotion, which was published in 2016. According to Gaspar de San Agustin, “the general donated to the Augustinians an ample piece of land for the construction of the first convent and the church where the image had been found.” Fr. Medina believes that the land “is one long block on each side [and] is the largest in the city and the most beautiful. The cloister is very spacious [with] plenty of rooms.” Although the natives were at first afraid to meet with Legazpi because they feared retribution for the death of Magellan, they finally warmed up to him and sked for pardon. But they were told that for their “fears [to] be appeased,” they needed to convince Rajah Tupas, their chieftain, to show up and sign a peace agreement. But according to Dr. astrid Sala-Boza, “the other church” that Fr. Media was referring to is in fact the church that became the Cebu Metropolitan Cathedral. 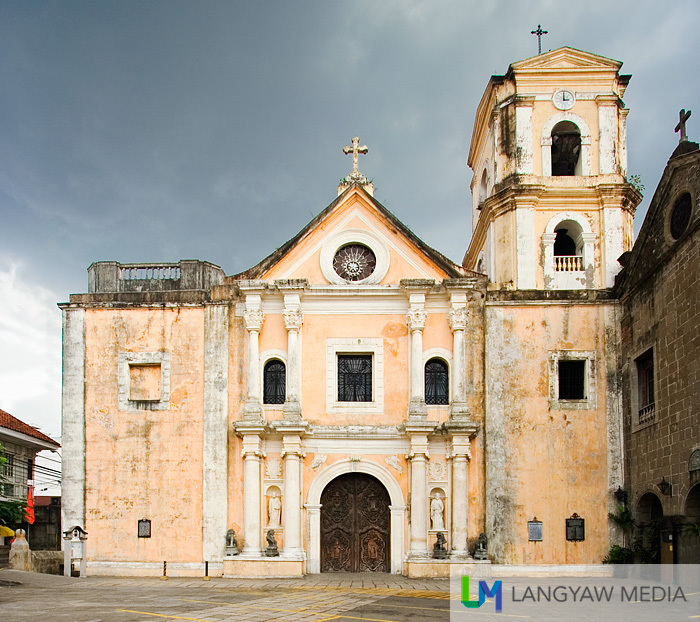 It was constructed in accordance with Legazpi’s order to establish a house of worship for the general population. This was not built on the site where the image was found but it served as the temporary home of the image in the beginning. On the day the image was found, it was taken in procession to this church. According to Blair and Robertson, “the sites for the Spanish quarters and the (major) church were chosen. The site of the house where the sacred image was found was selected on the site of the Monastery of the Name of Jesus and (concomitantly) the Church (of the Santo Niño)… from the said house the Child Jesus was brought to the major Church in solemn procession with great devotion and rejoicing.” It was not until 1598 when Cebu’s first bishop, Bishop Agurto, officially founded the cathedral and assigned clerics there to minister to the Spaniards, leaving the Cebu natives under the administrator of the Santo Niño Convent. Sala-Boza believes that “a correlation of these data with the documents cited by Rodriguez shows that the site of the present Basilica del Sto. 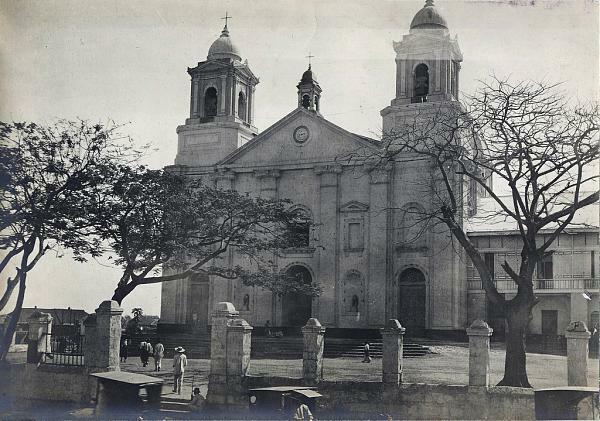 Niño is indeed the site of the finding of the image.” She also concludes that “the probability of the first procession took place in what would have been the temporary church built on a site other than the site of the finding of the Holy Image, namely the church which was eventually to become the Cebu Metropolitan Cathedral. Who writes that “the icon was solemnly taken in procession to a church, which had been set up in a bower of branches with a covering of hay while the principal church was being constructed within which [the image] is being venerated today.” This account is confirmed by a notarized document chronicling the finding of the image, which is not questioned by noted historians such as Rodriguez, Esteban de Salazar, and others. First, Juan de Camus brings the image from the burned house; second, he marks the site of the finding; third, the image is brought to Mateo del Saz at the flagship to show it to Legazpi; fourth, the image is taken in procession from the ship back to the house where it had been found; sixth, the temporary church 9chapel) was near the house where the image was found, the place in which the principal church of the Holy Name of Jesus was later constructed.” The procession thus started at the shore where the ships were anchored. The image was taken aboard every ship after its finding, and a temporary chapel was made in a bower of branches. According to Medina’s account, the procession headed toward the Augustinian church with the statue. From the Augustinian convent, it proceeded to the major church where a mass was held. Definitely, the procession took place only after the official signing of the documents guaranteeing the return and the entrustment of the image to the Augustinians. After the mass the image was taken back to the Augustinian convent. Therefore, although the route of the first procession appears to have been from the shoreline to the site of the house where the image was found, it maybe deduced that early processions commemorating the finding brought the statue from the Augustinian Church to the Cathedral. The contemporary route established in the 1980s takes the Santo Niño from the Basilica to the cathedral, then to San Nicolas, possibly in keeping with a strong oral tradition (actually a counterfactual) on the finding of the image there. 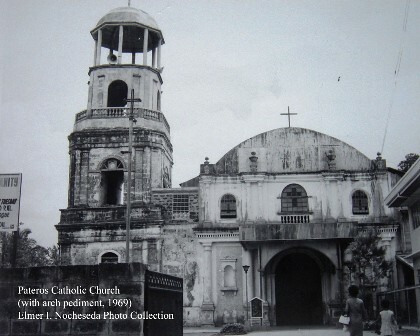 Sala-Boza’s work is considered a collection of historical, archeological, and geographical evidence which primarily establishes the already well-known legality and historicity of the location of the Santo Niño Church as the same site where the image was discovered; it is not in today’s Barangay San Nicolas. She also discusses another contemporary Santo Niño procession, which takes place on the third Sunday of January and ends with the transfer of the Santo Niño from San Nicolas to the Basilica of the Santo Niño, the counterfactual that the image was found in San Nicolas. With the growing renown of the miraculous icon, the Santo Niño was honoured with the ceremonial Spanish military rank Excelentisimo Capitan de las Fuerzas Españolas en Filipinas. As captain general, the basilica was his headquarters. During his feast day, the Santo Niño has always left the basilica in a procession, thus vacating his headquarters. Spanish military tradition required that a commanding general’s headquarters must never be left unguarded. Thus, the tradition of bringing our the Santo Niño de Cebu for the annual fiesta procession required the appointment of a teniente general, a rank lower than captain general, which was given to the Santo Niño of San Nicolas. Known as El Teniente, this image has the main duty of standing guard as second in command in the Basilica whenever the Santo Niño goes in a procession and on a few other occasions when it leaves the basilica under extraordinary circumstances. One such event occurred when it was taken to Manila in 1965 for the closing ceremonies of the fourth centennial of the Christianization of the Philippines. This Spanish military tradition does not in any way imply that the was found in San Nicolas. Neither is it about the re-enactment of the first procession which brought the Santo Niño from what some people claim is the actual site of the finding of the image in San Nicolas. Rather, the visit by the icon from San Nicolas to the basilica on the feast of the Santo Niño is a sign that the Santo Niño icon, although not physically present at the basilica, remains in command on that day. Over the years that followed the convent would serve as the residence, infirmary, and retirement home of the priests. Only two Augustinians were assigned to the convent during the early years; a priest who served as prior and a professed brother. Adjacent to the convent was the Magellan’s Cross which the natives venerated with greatest devotion. This cross became a symbol of peace which eventually led to the amalgamation of Western and Eastern cultures as the Philippines evolved into the only catholic nation in Asia over four centuries. The Cebu City hall or ayuntamiento was among the most important foundations of the colony and its alcaldes mayors became the pillars of the community after the grant of a royal cedula by Philip II. By the time he settled in Cebu, Legazpi had travelled a distance of 2,060 leagues after taking possession of Guam and reaching Samar, Leyte, Camiguin, Mindanao, and Negros. He had also concluded a historic blood compact in Bohol, where today he is remembered with a bronze statue on the where it took place. The sangrarse (blood compact) was a native ritual that sealed a peace agreement. A few drops of blood were taken from each of the two principal participants usually from their arm or chest to mix with wine. By drinking this mixture, the signatories entered into a lasting pact of friendship. While the military paved the way, Catholicism completed its conquest of all but the southernmost islands of the archipelago. The missionary zeal of regular orders was crucial, trumping problems like local defiance, language gaps between the missionaries and communities, and lack of missionary manpower that plagued early evangelization efforts. Legaspi’s pilot and chaplain, Fray Andres de Urdaneta, led the charge, along with five other Augustinian fathers. Drawing from missionary experiences in the America, the Augustinians delayed baptisms until the candidates demonstrated at least some evidence of Christian knowledge. In 1569, after reinforcements from Mexico arrived, the Augustinians took Cebu under their wing and, remembering the image of the Santo Nino recovered there, called the new Spanish settlement Santisimo Nombre de Jesus (the Most Holy Name of Jesus). The friars then followed Legazpi to Panay. Displaying commitment and dedication, an Augustinian, Fray Juan de Alba, subsequently learned the Hiligaynon language to aid in converting the populace. Meanwhile the seizure of Manila promted the friars also to proselytize in Luzon. Their eventual success heartened the Church to send more missionaries to the islands. Four orders joined the Augustinians: the Franciscan (1577), Jesuits (1581), Dominicans (1587), and Recolects (1606). They divided the archipelago into spiritual jurisdictions – the Augustinians and Dominicans took northern and central Luzon; the Franciscans, southern Luzon; the Jesuits, southern Visayas and Mindanao; and the Recollects, northeast Luzon, its nethermost islands, northern Visayas, Palawan and Mindanao. Missionization followed a regular pattern. Friars converted the local chief and his entourage, convinced that they would be followed by their constituencies. Friars then set up their mission, including a convent, church and school. They provided children with pre-baptismal instruction, to ensure that future members of the community were Catholics and sympathetic towards the Spanish. To earn the trust of potential converts, friars eschewed Spanish and conducted catechism in the local languages. Of course translation was not always feasible: Latin and Spanish words for concepts such as God, the Holy Spirit, and grace were retained where they had no equivalents in the vernacular tongues. Visual aids complemented the teaching: depictions of a fiery hell instilled fear among coverts, convincing them to remain faithful. A New History of Southeast Asia By M.C. Ricklefs, Bruce Lockhart, Albert Lau, Portia Reyes, Maitrii Aung-Thwin, 88-89. 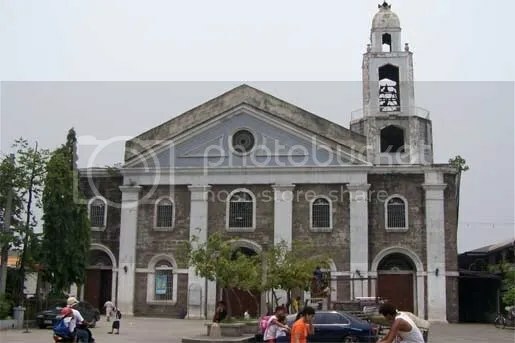 Most of the cities in today’s Metro Manila were part of the province of Tondo during the Spanish colonial period and most of the churches in these cities were founded by none other than the pioneering Christian missionaries in the country: the Augustinian Friars. Aside from San Agustin Church, Monasterio de Guadalupe and the friary in Mandaluyong, the Augustinians also built the churches of Tondo, Malate, Pasig, taguig, Pateros, Parañaque, Navotas and Pasay. According to Fr. Lucio P. Gutiérrez, OP, the friars who came to the Philippines during the 1st one hundred years of evangelization were men of high learning and of proven virtue. They were, above all, zealous and apostolic men, a product of a reformed Spanish Church well before the appearance of Protestantism in Europe. These apostolic and zealous friars were the ones who founded these magnificent churches that until now are still being used as places of worship by millions of Catholics in Metro Manila. Sto. Niño de Tondo ChurchFrom the very beginning, the firars placed Tondo under the patronage of the Holy Child or the Santo Niño, whose devotion remains to be one of the most popular and extensive in the country today. Malate ChurchMalate used to house a miraculous image of Nuestra Señora de los Remedio (Our Lady of Remedies), the patroness of mothers. The devotion to the Virgin made Malate very famous and people flocked to the church especially on Saturdays. Today, the parish of Malate is being administered by Columban Missionaries. Immaculate Concepcion Church PasigPasig’s church aside from being the oldest Marian parish in the country went from being an iglesia parroquial in 1573 to a cathedral in 2003. Pasig’s patroness is the Immaculate Concepcion. The whole territory of the Diocese of Pasig used to be Augustinian mission areas and the 3 oldest churchs (Pasig, Taguig and Pateros) in the diocese were all Augustinian built. Santa Ana, the mother of the Blessed Virgin Mary, is the patroness of Taguig. The city’s populase still celebrates with much grandeur the fiesta of their patrona every July 26 with a solemn novena and a fluvial parade along the Taguig River. Pateros is famous for its duck raisers hence the town’s name. San Roque was named patron but the local Catholic faithful also highly venerates Santa Maria de Betania because of a legend that the saint saved their ducks and fowls from a monstrous crocodile that plagued their livelihood. San Andres Apostol is the city’s patron saint but every August 10, devotes from the south of Manila flock to this church to celebrate the fiesta of Nuestra Señora del Buen Suceso (Our Lady of the Good Event). Like Pasig, Parañaque too is now the seat of the diocese with the same name. Malabon ChurchMalabon and Navotas are famous for their fish ports. Malabon’s patron is San Jose while Navotas recently celebrated its 400th foundation Anniversary as a parish. Both churches are now part of the Diocese of Kalookan. Pasay ChurchPasay was one of the last parishes founded by the Augustinians. Santa Clara de Montefalco, the namesake of the more popular Santa Clara de Asis and the first canonized Augustinian nun is the city’s patroness. Today, as the Augustinian friars celebrate the 450th anniversary of their presence in the Philippines, only two (2) of these churches are under their care: San Agustin Church (Immaculate Conception Parish) and the parish of Nuestra Señora de Gracia in Guadalupe Viejo, Makati City. The rest were either ceded to the diocesan clergy or given to other religious congregations. Pedro G. Galende, OSA, Angels in Stone, (Manila: G.A. Formoso Puiblishing, 1987), 17. Lucio P. Gutiérrez, OP, Archdiocese of Manila: A Pilgrimage in Time. Volume I. (Manila: The Roman Catholic Archbishop of Manila, 2000), 17. Written by Fr. John Paul Mabanta, OSA, in Monasterium 2015, Official Publication of Monasterio de GUadalupe, Makati City. The first group of Augustinians, under the leadership of the Venerable Andres Urdaneta, came to the Philippines in 1565 from Spain through Mexico as the pioneers in theCatholic Church‘s task of evangelization in that part of the globe. Originally establishing themselves in Cebu, these missionaries soon expanded their apostolic activities to the neighboring towns and islands and later to almost all the other principal regions of the archipelago. On March 7, 1575, the then Prior General of the Order, Fr. Tadeo de Perusa, decreed the creation of a new Augustinian Province in the Philippines under the title Santisimo Nombre de Jesus de Filipinas – Most Holy Name of Jesus of the Philippines. During the Spanish colonial times in the Philippines, they founded almost three hundred towns and churches from 1565 to 1898. At the turn of the twentieth century, the Province of the Most Holy Name of Jesus of the Philippines decided to shift its missionary activities to newer territories, such as Peru,Colombia, and Venezuela. As a logical consequence of this move, the seat of the Province was transferred from Manila to Madrid. The Augustinian presence in the country was then reduced to a minimum. To compensate for this loss of manpower, the remaining Augustinians intensified the recruitment and formation of Filipino candidates. And as the number of the latter increased and their preparedness adequately established, the idea of creating a new Province came to be seriously considered. Plans for the organization of such a Province began in 1974 when the Regional Assembly of the Philippine Augustinian Vicariate asked for the creation of a Vice-Province in the islands. Though the plan was not realized, it was again revived by a group of Filipino Augustinians at a meeting in the Basilica Minore del Santo Niño in Cebu on April 29, 1981. The plan this time was for the creation of a new Province. The move to create a new Province, which would be called the Province of Sto. Niño de Cebu-Philippines, was officially endorsed by the Regional Assembly of the Augustinian Vicariate of the Philippines at the closing of its sessions on August 19, 1981, in the Monastery of San Agustin, Intramuros, Manila, and by the Provincial Chapter of the Province of the Most Holy Name of Jesus of the Philippines, held in Valladolid, Spain on July 17, 1982. The proposal was overwhelmingly approved by the members of the 174th General Chapter held in Rome on September 15, 1983, and the new province was canonically established on December 25, 1983. The province was officially formed on September 13, 1983, inside the Istituto Patristico Augustinianum in Rome during the 174th General Chapter of the Augustinian Order, where ninety-three delegates approved the creation of the first indigenous Augustinian province in Asia after over 400 years of control by Spanish religious leaders. The Province of Sto. Niño de Cebu gained autonomy from the mother province, theProvince of the Most Holy Name of Jesus of the Philippines, which is based in Spain. The first Prior Provincial was Rev. Fr. Eusebio B. Berdon, OSA, who later became an assistant Prior General of the Order in Rome. Initially, the Province had thirty-six friars and religious brothers and sixty-one aspirants, novices, postulants and theology students. Basilica Minore del Santo Niño, also called the Basilica of Sto. Niño de Cebu, where the image of the Santo Niño de Cebú is kept. University of San Agustin in Iloilo City. University of San Agustin Extension Campus at Sambag, Jaro, Iloilo City. Colegio San Agustin-Bacolod in Bacolod City. San Jose Parochial School and Parish in Plaza Libertad, Iloilo City. Colegio San Agustin-Biñan in Biñan, Laguna. Guadalupe Monastery in Makati City. San Agustin Center of Studies (San Agustin Major Seminary)/ San Agustin Center of Studies in Quezon City. Augustinian Novitiate and Prayer House in Talisay City, Cebu Province. Of the lamentable events of Father Martin de Rada and Father Agustin de Albuquerque in the voyage they undertook to China, the end that the venerable Fray Diego de Herrera met was the most unfortunate and fatal, with the new operatives who accompanied him to these islands, in the propagation of the faith not only there but also in this archipelago and that of the vast empire of China, whose tragedy is retold but historians. However, I preferred to follow the narrative he makes it to the letter, as well as about the life of such an apostolic gentleman, as written by Fray Jose Sicardo in Adiciones a la Historia Mejicana. When the Adelantado Miguel Lopez de Legazpi died, a box of pliegos which contained the list of his successors was opened. The number one appointee was the former master-of-camp, Mateo del Saz but this had died in Mindanao in April, 1567. The next on the list was Guido de Lavezares, the treasurer of the expedition and companion of Legazpi since the day they sailed out of La Navidad. At the time of Legazpi’s death Lavezares was in Cebu as governor of the first Spanish settlement in the Philippines. Although of advanced age, (he was with the Villalobos expedition thirty years before), he was still quite strong and he had the wisdom and prudence gained through age and experience. He came to Manila to assume his post. The Augustinians had by this time taken charge of the pacified sectors of the country. They had put up doctrinas or small settlements for recently Christianized Filipinos, and mission sites or reducciones for non-Christian natives. For their fast conversion the Holy See granted them certain religious exemptions and privileges. As usual there were anuses from the soldiers, Spanish and Europeans – most of which fell under extortions and unjust collection of tributes. P. Rada on June 1, 1574 sent a letter of complaint to Governor LAvezares asking him to write to the King and give His Majesty a true account of what was being done in the Islands. P. de Rada himself sent the following letter to the Viceroy on June 24, 1574. “My Lord – Your Lordship has requested my written opinion on the affairs of this land so that you may do whatever is necessary for the better service of God, of the King and of our conscience. I reiterate what I said yesterday in Oton. That it would be best to hold a meeting of all the priests here so that we may confer on the affair of this land and till then there should be no changes so that the Indians shall only pay a tribute of seventy gantas of rice and one blanket per head. You also know that many of the priests in their sermons, confessions and conversations, rightly objected to the tribute so that I feel that this meeting is necessary. All the priests here have told me that it is their opinion that Spaniards hve no right to these lands because although in general there may be many just motives for war still war may not be carried out without an express order from the King. And since the King has never ordered us to make war for in a letter addressed to the late Governor, which I have read, he says that he wishes us to act in friendship, it follows that any armed conquest made in these islands is unjust even though we may have had cause to make war. Furthermore, there has hardly ever been just cause for we have gone everywhere, soliciting friendship and tribute and even where tribute is promised we have made war when they do not give as much as we want and where tribute is refused we have burned and killed as is now the case in the towns of Camarines where the Indians for fear of us have fled to the hills for we have burned their houses and caused much damage. I will not speak of the towns that we have raided without warning, for what right do we have to subject them and to collect tribute from them, specially where we have s yet rendered them no service in exchange for their tribute? What right do we have to ask Ilocos to pay us three measures of gold without further parley? This we have also done in Camarines and Cuyo and in all other towns that are at some distance from our own. Is it not clear that this is not just? Hence, he who sends the soldiers, he who commands them, the soldiers themselves, those who share the booty with the soldiers, those who aided them and those who do nothing to stop them although they are able to do so are all guilty and are jointly and severally bound to restitution. As regards the Indian towns next to our own, although it is true that we protect them and preach the Gospel to them still they have their own grievances for we make use of them in our many voyages and whereas they were free they are now vassals. Furthermore, we do not give them as much protection as we should for there are as many pirates as before and they are subjected to raids from the Indians who are still not pacified. The fact that His Majesty ordered that the land be distributed is not good enough in conscience for His Majesty is ill-informed and many things were done against his will and even in those cases where we agreed that encomiendas should be given we did so only to avoid greater evils. “Besides, the Indians now pay three measures of gold which is excessive as we who deal with them and are acquainted with their hardship well know for they are compelled to eat roots and hardly have clothing so that rather than pay tribute, they often destroy their houses and hide. In other cases, tribute must be collected by force of arms. Oftentimes, they hold the Indians prisoners to compel to pay. The priests are, therefore, of the opinion that under present conditions, each Indian should pay in food or clothing only to the value of one measure of gold as was done in new Spain. As time goes on, perhaps, they may give more. However, since they have already paid more that is due nothing further should be collected from them especially because we have acted without justice. Since you want my opinions, I believe that since we defend this land and reside here, Your Lordship and his Captains must send to the King true accounts of what has been done here and how we are collecting the tribute so that the King may do what is proper and in the meantime the tribute should be reduced and those of us who have something should share it with those who have nothing so that we may deserve this tribute. Your Lordship should protect the natives, doing justice, redressing their grievances and putting down the pirates and we in turn shall preach the Gospel. I sign this opinion in San Pablo, Manila, June 21, 1574. Lavezares wrote to the King on the 17th of July, 1574, giving his own opinions on the tribute. The letter gives a picture of conditions in the country a few years after the conquest, and also a brief but interesting history of the first explorations from island to island prior to the landing at Cebu. You Majesty – I believe that when Father Martin de rada, Provincial of the Augustinians, wrote his opinion on local affairs and on the tribute paid by the natives, he did so having in mind only the service of God and the good of our consciences. However, even the best minds sometimes err either through excessive zeal or even through ignorance. I would like to point out a number of things in his opinion, which I believe would cause grave damage to our interests here. On the basis of your letter borne by Captain Juan de Isla he holds Your Majesty to be ill-informed. This is an error on his part because what you say in your letter is merely what you said before when you first had news of our affairs. You were advised that the late Governor Legazpi entered into friendly terms with the natives. Thus when we first landed in the island of Ibabao, the Indians came and we made friends with them and we gave them food, merchandise and other things without asking from them anything in return. The same was done in the Calayan River where Captain Andres de Ibarra and Fr. Diego de Herrera went. We made peace and we took nothing from them. As a matter of fact, although a number of the natives of Ibabao killed Francisco Gomez and one other Spaniard, even then, we did not make war on them. Legazpi went from island to island inviting the natives to be our friends and waged war on no one. Thus in Bohol the principal natives came willingly to our vessels and promised to be your vassals. From Bohol, we sent Captain Juan de Isla and the said Father Provincial to Butuan. From Butuan they went to Cebu where they parleyed with the natives from the ships but the natives showered arrows on the vessels. Seeing this, Father Andres de Urdaneta told the men that since the Cebuanos were apostates, it was lawful to make war on them and so we did. The Governor then built his capital in Cebu and while there, many of the Indians of the surrounding islands and even those of Cebu itself agreed to be Your Majesty’s vassals without the need of war but merely by speaking softly and giving them presents of clothing, merchandise, food and other things. When these friendly Indians were later raided by other Indians we protected them. All these we have repeatedly told Your Majesty. Fr. Rada states that we have no just title to this land. We are not lawyers. All we know is that we have come here in obedience to your order. That is sufficient for us. As far as the robberies and damages are concerned, we are not to be blamed because on repeated occasions the natives have made war on us especially in Manila. When Martin de Goite first came to Manila he entered into a treaty of friendship with the Rajahs of Manila. However, despite this, the natives tried to finish him off for no reason at all and they fired at his vessel with five or six cannons so that the Spaniards in self-defense were compelled to attack the town. We later burned it purely for our own safety. The very natives have later admitted that it was they who began hostilities. It is true that we have raided towns but we have done so only in the case of such towns as revolted against Your Majesty’s authority for it was necessary to humble their pride for the greater safety of the friendly Indians. While obviously excesses were committed this should not be held against all of us because your Governors have in every case tried to conform to your Majesty’s order. And it is the natives who are be blamed for the damages caused for they have made war on us with ambushes and stratagems and if we went about unarmed, they could capture us and torture us to death, so that it is necessary for us to be always ready to use force. Before we came here, the natives were prone to kill each other for light motives and we have to adapt ourselves to these conditions. I agree that it is only fair that the natives be protected and dealt with justly and so we defend all friendly towns near us not only from external raids but even from internal troubles. Hence, peace and order have improved greatly and the natives may now trade without hindrance or fear of robbers. Whereas, there used to be banditry, now there is security and the pirates have been pushed back to those parts where we are not. These pirates do little harm for we capture and punish them and even now some of them are our prisoners here in this City so that as time goes by the damages they cause shall diminish. We have collected large amounts of gold as tribute in Ilocos and Camarines without benefit to the natives but you must understand that in order to eat we need to be supported by the natives. Furthermore, we cannot protect them unless they first pay tribute. Even then, we only get what they are able to give without hardship and they pay in much coin or merchandise as is available to them so that some provinces supply us with food, others with wax, others with whatever they have. Ilocos and Camarines have paid their tribute in gold because they more of god than of clothing and food which are harder to come by there than elsewhere so that those natives prefer to pay their tribute in gold rather than in food or supplies. So far we have not settled those provinces because we lack men. And even so, Captain Juan de Salcedo is now in Ilocos and has founded a town there with a priest to preach to the natives. We have not yet settled Camarines because we discovered the land only a short while ago but we shall settle there as soon as possible. In so far, as the alleged excessive tribute is concerned, please note also the provinces here differ in wealth, some being rich and some poor, some abound in farmers, others in merchants, others in mines and others in robbers. With this in mind, the late Governor Legazpi assessed the tribute of the towns around Manila Bay at two bushels of palay and one colored blanket, two yards long and one yard wide per year or if they so prefer to give three measures of gold or such other equivalent merchandise as they may want to give. In fact, this tribute amounts to six reales of silver every year for a measure of gold is worth two reales or at most two and one-half reales. Your Majesty will see that this tribute is moderate for it does not amount even to one-half of that paid by the Indians of new Spain and this is the tribute levied on the Muslims here for they are men of means with farms and merchandise and wealth, so that in four days they may earn enough to pay the tribute for one year. The Indians have many sources of income and thus they have much gold and jewels so that the principal natives wear on their person in jewels alone ten to twelve thousand ducats of gold aside from their lands, slave and mines and even the individual Indians carry on their persons bracelets of gold, so much so that even slaves wear jewels. It is false to say that the poverty of the Indians is such that they have to eat roots. The truth is that is their custom on certain months to eat camotes and sago-bread and that it is not because they lack the means but because they eat all kinds of food and they would rather spend their time drinking in feasts than in walking four leagues out of town to buy rice. Even then, this happens only in some of the Visayan Islands. Please take into account also that sometimes the natives, as a sign of mourning, abstain from eating rice so that in certain parts of the Visayas they other grains, fish, pork, chicken and many varieties of liquors. That does not mean that they are poor for they have gold, slaves and land and while they have less than natives of Luzon it is because they work less. We have taken this into account so that the Visayans only pay one-half bushel of palay and one grass blanket for their tribute and we have assessed every province in accordance with their means. So far, their tribute is so moderate that it can be easily paid because with our coming the natives are more prosperous than ever. It is not true as Father Rada says that a tribute of one measure of gold is sufficient. Even now we find it hard to live with a tribute thrice as large especially those of us who are entitled to collect tribute from only three hundred Indians or even five or six hundre Indians. Only those are well-off who are entitled to collect a thousand tributes. Things here are very expensive. A pair of shoes is worth one-half tael of gold which is equivalent to the tribute of eight Indians. A shirt is worth six pesos and everything else is worth twice as much as in New Spain, so that if the Indians pay only one measure of gold which is two reales for their tribute we would be unable to live here. Take note of the fact that the natives are wealthier than those of New Spain for they have clothing, silk and cloth of gold, fine porcelain, spears, pottery, daggers, bells, earthenware and other chattels as well as food that comes from irrigated lands as well as wines that they manufacture from palms and nipa as well as wax, gold and cotton from which they make blankets. Also, the Chinese bring them silk, porcelain, perfumes and iron, so that it is easy for the natives to pay their tribute, and if some of them refuse to pay it, it is not because of a lack of means but rather of a lack of wish to do so. It sometimes happens that when some of the Indians are drunk, they threaten us and refuse to pay tribute. If some of them go about without clothes it is not because of lack of clothes because they have clothes. Consequently, although the Father Provincial and other priests may have a good intention their opinion, if followed, would prejudice these lands and the natives because if tribute is not paid, the Spaniards will go about stealing as they used to do. It is best for all concerned that tribute be paid, thus we have now greater security and trade is benefited. If he was talking about customs, in Cebu this is still popular in the month of November or the celebration of the All saints day. And even in Holy Week, root crops are basically cooked. Is this how the missionaries adopted to the custom of the early Filipinos? Is this a typical custom of Filipinos that they prefer to drink maybe alcohol, which tuba is already available? Source: Maza, R. Morales. Augustinians in Panay. Iloilo: University of San Agustin Press, 1987. pp. 84-95. Where are the Augustinians now in the Philippines after 450 years of presence? If you remember, the Augustinians first landed in the Philippines from Mexico. The Augustinian priest and navigator, Andrés de Urdaneta O.S.A. discovered the sailing route for returning from the Philippines to Mexico in 1565. The first houses of the Augustinians were established at Cebú in 1565, and at Manila in 1571 (famously known as the place of the San Agustin Church in Intramuros, the San Agustin Monastery). According to a report published in March 1898, the Province had under its care 2,377,743 Filipinos, 234 parishes and missions, 22 regions or missionary districts, and a total of 618 Augustinian priests, brothers, novices and professed. Members of the Order had founded over 300 towns and built over 300 churches in the Philippines. 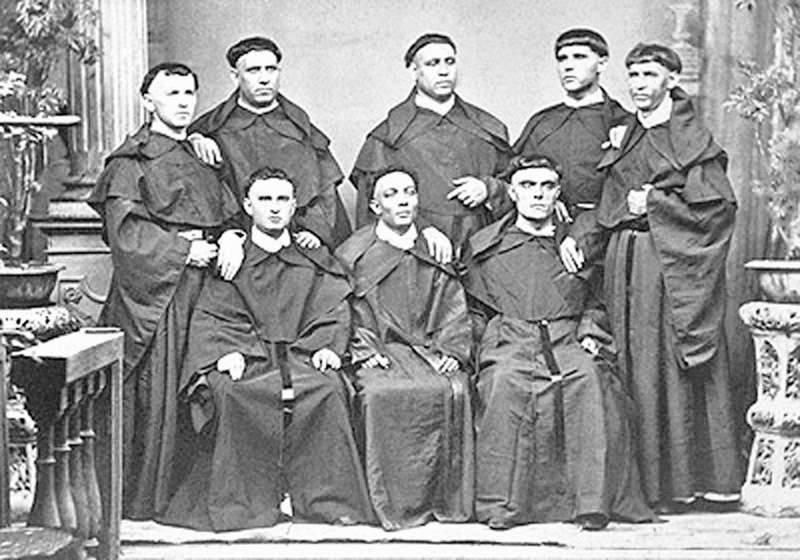 In the history of Augustinian presence in the Philippines since their arrival in 1565 together with Miguel Lopez de Legazpi, there had been 18 Augustinians who were appointed and served as bishops to the four major archdioceses in the Philippine islands – The Archdioceses of Manila (1579) Cebu (1595), Nueva Caceres (Bicol-1595), and Nueva Segovia (Ilocos-Cagayan – 1595). The first Augustinian bishop is Pedro de Agurto in the Diocese of Cebu and he is also the first Bishop of Cebu when it was made a dioceses in 1595. And, the last Augustinian bishop is Arsenio del Campo y Monasterio in the Diocese of Nueva Caceres from November 25, 1887 to July 20, 1903. Here is the list of the Augustinian bishops in the Philippines since 1595, 30 years after the Augustinians first arrived.